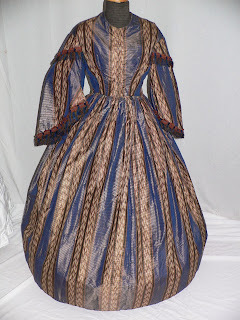 This is a wonderful silk striped dress from the civil war era. 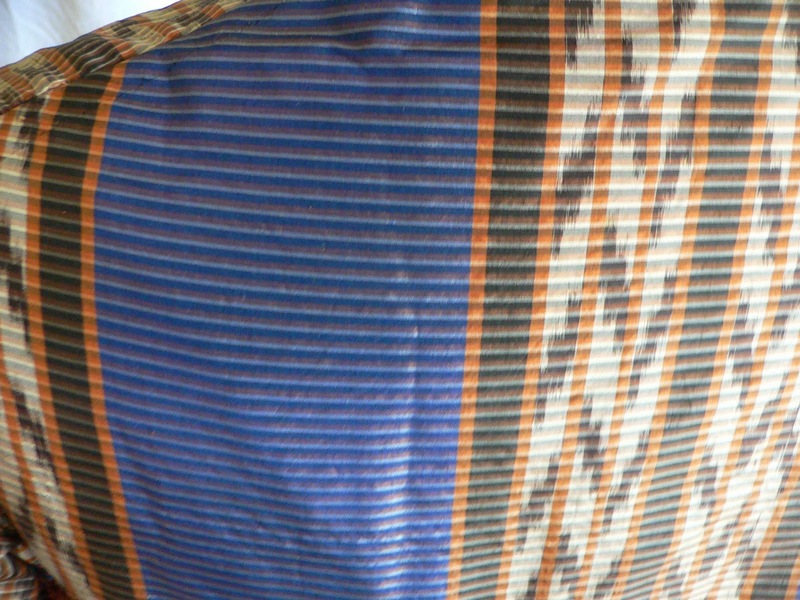 The pattern is blue horizontal stripes alternating with a browns and beige double patterned stripe. 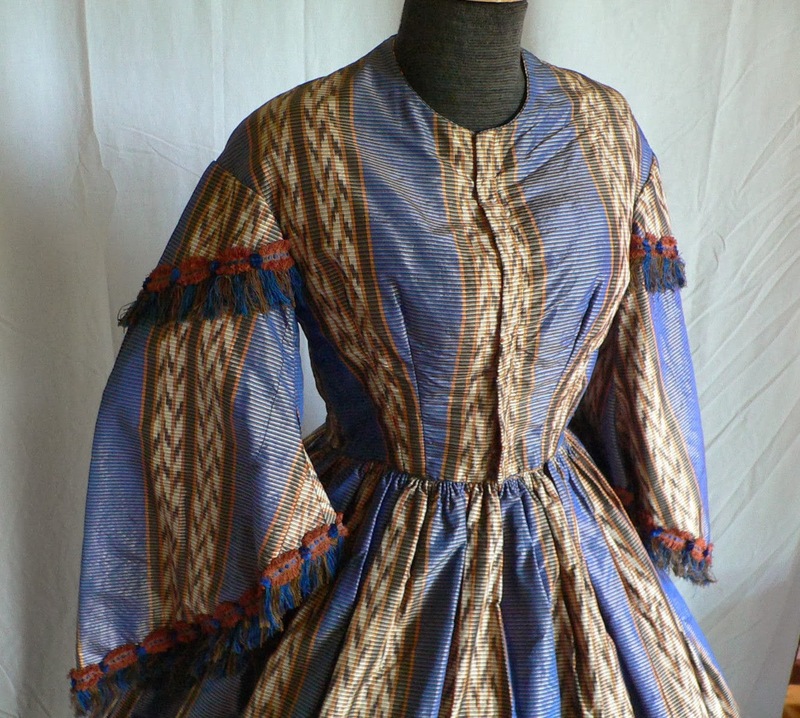 It has dropped shoulders with a lovely navy and rust complimentary fringe trim. The bodice is lined with cotton and has 5 stays in the front .Closure is with an inner cotton tab with hooks and regular eye hooks down the front. The sleeves are pagoda styled and they are lined in tan cotton with the last 5 inches lined in blue silk. 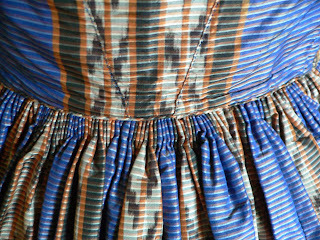 The bodice is joined to the skirt with hand sewn cartridge pleating. 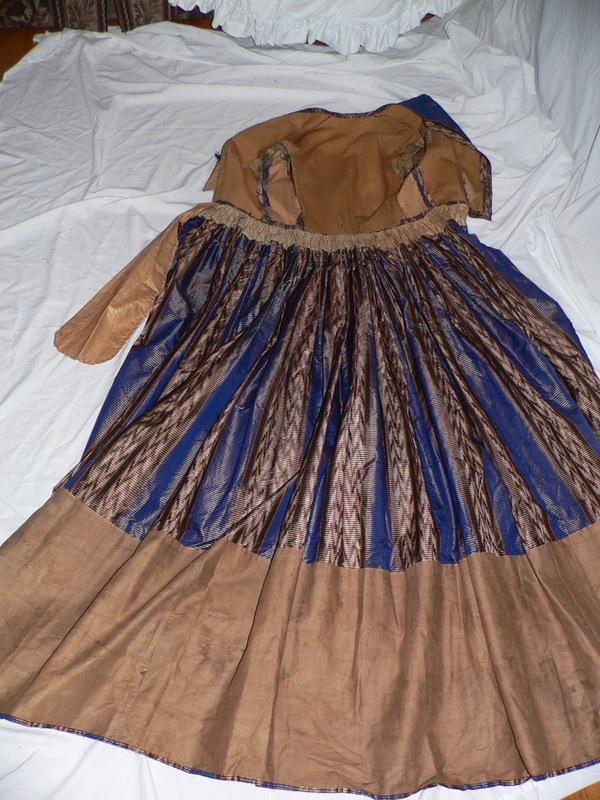 The skirt is not lined but it does have a 12 inch tan cotton lining at hemline. 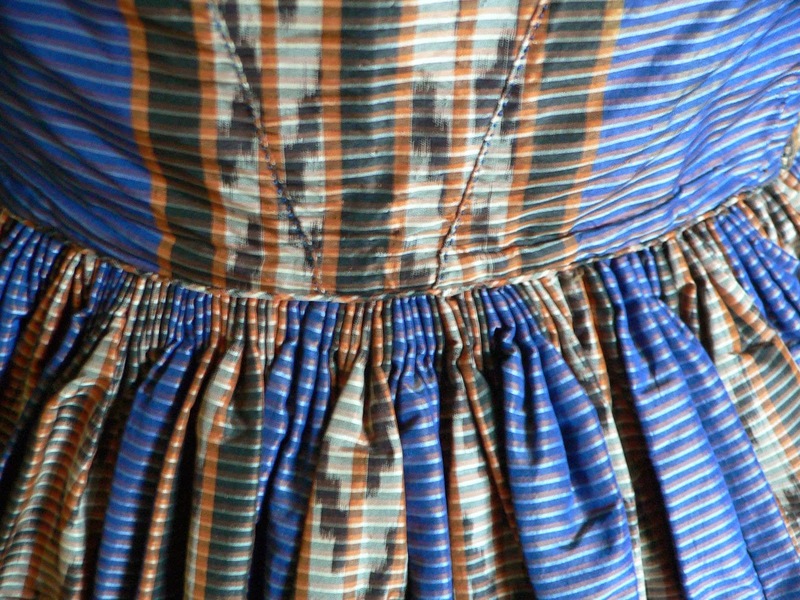 There is a hidden pocket in one side seam. 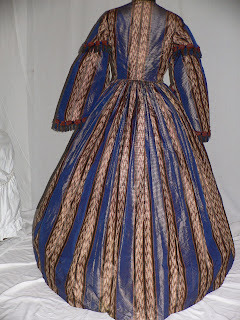 There is quite alot of hand stitching with some machine in the bodice. 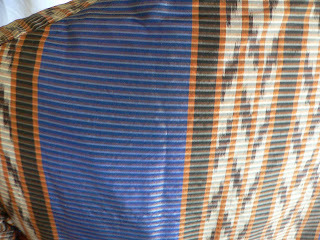 The skirt seams appear to be hand sewn. 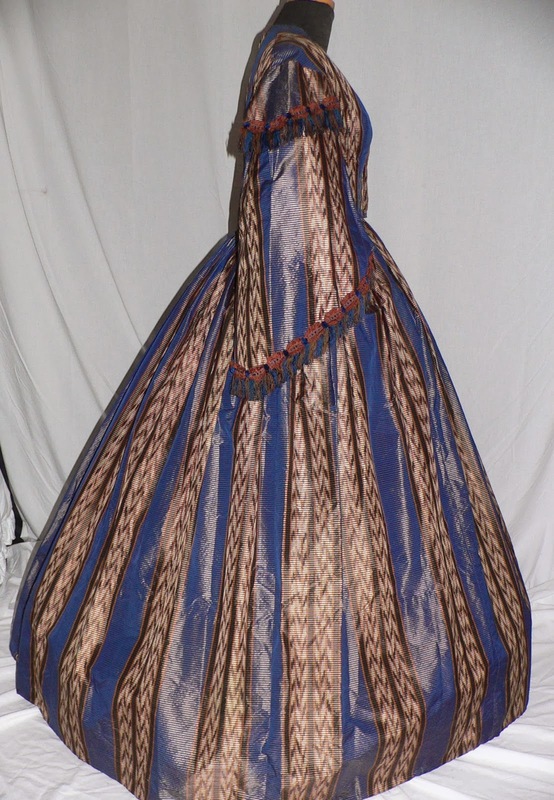 Measurements: Bust 35 inches, waist 29 inches, length 53inches from shoulder, sleeve length is 22 form the dropped seam and circumference of skirt is approximately 130 inches. 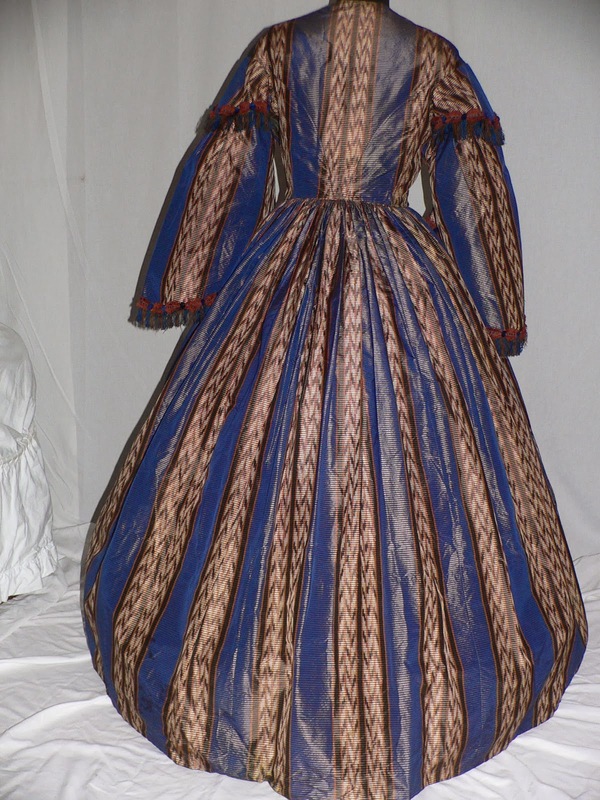 These areas were only found in holding the silk up to the light and could not be seen when on the form. It was found in Mass. at a local auction from an estate with other period items including a Doucet partial 2 pc velvet gown. LOL! I love those stripes, too. 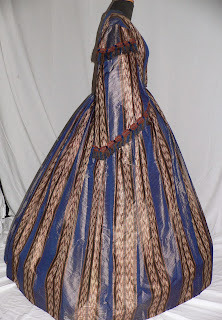 I usually like tamer combinations, but this fabric is perfect for the dress.